Five Opening Day Tailgating Tips | Hupy and Abraham, S.C.
Come out and celebrate with Hupy and Abraham at the 2017 Brewers opening day on Monday, April 3! Opening day is a huge event in Milwaukee with thousands of fans flocking to Miller Park to enjoy opening-day festivities. The first game of the year is against the Giants, and of course, involves tailgating. As a proud sponsor of the Milwaukee Brewers, Hupy and Abraham would like to take this opportunity to provide Brewers fans with some tailgating safety tips for a safe opening day. Cook with caution: Cooking outdoors for friends and family is often the best part of tailgating. However, it’s important to ensure that you keep cold foods cold, hot foods hot and make sure that all meat products are thoroughly cooked to avoid potential foodborne illnesses. Foods left out for more than an hour should be thrown away. Prevent grill fires: If using a gas grill, be sure to check all hoses and remember to never light a gas grill with the lid closed as it can cause an explosion. Also, keep all grills a safe distance from tents and vehicles. And keep a fire extinguisher close at hand. Clean up after: As a courtesy to the park, fellow fans and your tires, make sure your tailgate area is tidy before going into the game, and when leaving for the day. Be sure to pick up trash, extinguish all flames and hot coals and inspect the area for any broken glass that can potentially damage a vehicle. Don’t drink and drive: Alcohol consumption is often synonymous with tailgating. But because alcohol impairs decision-making, it’s important to keep an eye on friends, and to designate a driver when it’s time to head home. When heading in for the first pitch, those seeking a more family-friendly experience can head to sections 217, 308, 309 and 417, known as the Miller Park Family Sections. In these sections, the serving and consumption of alcohol is prohibited. 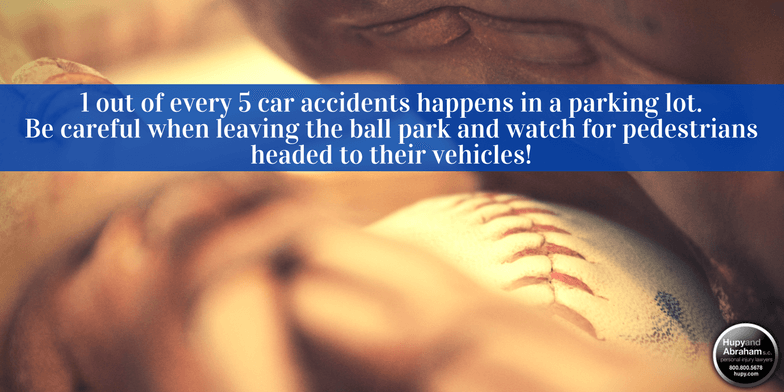 Pay attention in the parking lot: Traffic leaving the Miller Park parking lots after a game is very busy, and studies show that one out of every five car accidents happens in a parking lot. The most dangerous crashes in parking lots usually involve pedestrians, and especially children. So please be careful when leaving and watch for pedestrians headed to their vehicles. When you and your family and friends head out to celebrate opening day, we hope that you’ll keep these tips in mind, and have a safe and fun-filled day at the game, because true baseball fans know how to celebrate the right way. In the event that you or a loved one is injured due to a grilling incident or parking lot accident while tailgating, the experienced personal injury attorneys at Hupy and Abraham are here to help. Call 800-800-5678 for a free consultation, or you can start a live chat anytime at Hupy.com.